Persistence Market Research examines the global lysosomal storage diseases therapeutics market performance in a new publication. The primary objective of the report is to offer updates and information related to market opportunities in the global lysosomal storage diseases therapeutics market. The report provides key insights pertaining to various segments of the global lysosomal storage diseases therapeutics market and throws light on the key drivers, restraints, and trends likely to impact market growth in the next few years. The global lysosomal storage diseases therapeutics market report begins by defining various types of therapies available for treatment. This is followed by an overview of market dynamics influencing the global lysosomal storage diseases therapeutics market. Impact analysis of key growth drivers and restraints based on a weighted average model has been included in the global lysosomal storage diseases therapeutics market report after detailed analysis of individual regions to better equip readers with meaningful insights on ongoing developments in the market. The subsequent sections evaluate the present scenario and future growth prospects of the global lysosomal storage diseases therapeutics market on the basis of key segments – by Indication, by Type of Therapy, by End User, and by Region – and provide a detailed analysis of these segments in terms of market size, Y-o-Y growth rate, absolute $ opportunity, and BPS analysis. 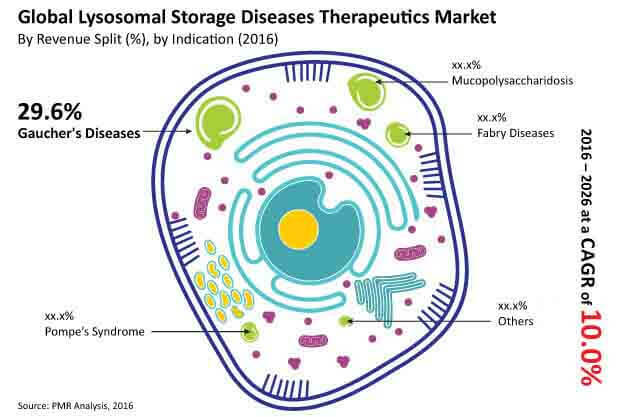 The global lysosomal storage diseases therapeutics market report provides an overall market outlook and discusses key regional trends contributing to the growth of the global lysosomal storage diseases therapeutics market worldwide and also analyzes the impact of drivers and restraints in each region. The final section of the global lysosomal storage diseases therapeutics market report includes a comprehensive competitive landscape to provide report audiences with a dashboard view based on categories of providers in the global lysosomal storage diseases therapeutics market product portfolio and key differentiators. Key categories of providers covered in the report are lysosomal storage diseases drug manufacturers. This section is primarily designed to provide clients with an objective and detailed comparative assessment of key providers specific to a market segment in the global lysosomal storage diseases therapeutics market value chain. The report provides segment-specific vendor insights to help readers identify and evaluate key competitors based on an in-depth assessment of capabilities and success factors. The report also profiles the main providers and discusses their long- and short-term strategies, key offerings, SWOTs, and recent developments in the global lysosomal storage diseases therapeutics market. Shire PLC, Pfizer, Inc., Sanofi, BioMarin Pharmaceutical Inc., Actelion Ltd., Raptor Pharmaceutical Corp., Protalix Biotherapeutics Inc., and Amicus Therapeutics, Inc. are some of the companies featured in the global lysosomal storage diseases therapeutics market report. The report considers 2015 as the base year and provides data for the forecast period. To ascertain the global lysosomal storage diseases therapeutics market size, Persistence Market Research factors in the revenue generated by manufacturers. The forecast presented in this report assesses the total revenue by value across the global lysosomal storage diseases therapeutics market. In order to offer an accurate forecast, the report begins by sizing up the current market, which forms the basis for how the global lysosomal storage diseases therapeutics market is expected to develop in the future. Given the characteristics of the market, data is triangulated on the basis of three different types of analysis based on supply side, downstream industry demand, and the overall economic envelope. Further, the report conduct forecasts not only in terms of CAGR, but also analyzes it based on key parameters such as Year-on-Year (Y-o-Y) growth rates to understand the predictability of the market and to identify the right opportunities across the global lysosomal storage diseases therapeutics market. To understand key growth segments in terms of their growth and adoption in the global lysosomal storage diseases therapeutics market, Persistence Market Research has developed an ‘Attractiveness Index’ to help providers identify real market opportunities in the global lysosomal storage diseases therapeutics market. Lysosomal storage disorders is a group of genetic metabolic diseases caused by enzyme deficiencies in various body cells. The global lysosomal storage diseases therapeutics market is anticipated to be valued at US$ 14.36 Bn by 2026, registering a CAGR of 10.0% over the forecast period. An increasing diagnosis rate due to rising awareness and financial incentives for orphan drug development to recover R&D costs is the primary factor fueling the growth of the global lysosomal storage diseases therapeutics market. Other factors driving the global demand for lysosomal storage diseases therapeutics include a faster uptake and faster market access, premium product pricing, and increasing focus of pharmaceutical companies in the research and development of drugs for the treatment of rare diseases. However, heterogeneity of the disease leading to underdiagnoses of lysosomal storage diseases, lack of treatment options, and high cost of treatment are factors likely to hamper the growth of the global lysosomal storage diseases therapeutics market over the forecast period. Advent of therapies targeting neuropathic manifestations by crossing blood brain barrier (BBB) and therapies that overcome immune response and have better tissue selectivity will define the future landscape of the global lysosomal storage diseases therapeutics market. The global lysosomal storage diseases therapeutics market has been segmented on the basis of Indication (Gaucher's Diseases, Fabry Diseases, Pompe’s Syndrome, Mucopolysaccharidosis, Others); Type of Therapy (Enzyme Replacement Therapy, Stem Cell Therapy, Substrate Reduction Therapy, Others); and End User (Hospitals, Clinics). The Gaucher's Diseases indication segment is expected to be the most dominant segment in global lysosomal storage diseases therapeutics market. This segment is expected to create absolute $ opportunity of US$ 151.7 Mn in 2017 over 2016. The Fabry Diseases indication segment is expected to be the second most lucrative segment with a market attractiveness index of 1.5. The Enzyme replacement therapy (ERT) segment is estimated to account for 94.7% revenue share of the global lysosomal storage diseases therapeutics market by 2016 end. This segment is expected to continue to lead the global lysosomal storage diseases therapeutics market during the forecast period. The Stem Cell Therapy segment is projected to register a CAGR of 7.1% over the forecast period. The Hospitals end user segment is anticipated to account for 66.9% revenue share of the global lysosomal storage diseases therapeutics market by 2016 end while the Clinics end user segment accounted for 33.6% revenue share and was valued at US$ 1,714.4 Mn in 2015. The global lysosomal storage diseases therapeutics market is segmented into the five key regions of North America, Latin America, Europe, Asia Pacific (APAC), and Middle East & Africa (MEA). In terms of value, Europe is estimated to be the dominant market in the global lysosomal storage diseases therapeutics market in 2016 and is expected to register a CAGR of 10.2% over the forecast period to reach a market valuation of US$ 5,105.1 Mn by 2026 end. North America is expected to be the second most lucrative market in the global lysosomal storage diseases therapeutics market over the forecast period. The North America market is estimated to account for 32.2% revenue share of the global lysosomal storage diseases therapeutics market by 2016 end. The Asia Pacific lysosomal storage diseases therapeutics market is anticipated to represent absolute $ opportunity of US$ 59.1 Mn in 2017 over 2016. The lysosmal storage diseases therapeutics market in the MEA region is estimated to increase 2.5X in value over the forecast period. Shire PLC, Pfizer, Inc., Sanofi, BioMarin Pharmaceutical Inc., Actelion Ltd., Raptor Pharmaceutical Corp., Protalix Biotherapeutics Inc., and Amicus Therapeutics, Inc. are some of the companies operating in the global lysosomal storage diseases therapeutics market. Top market players are investing in focused R&D initiatives to develop innovative products for the treatment of rare diseases and are looking to drive growth in established markets through strategic partnerships, collaborations, and acquisitions.